HARVEST MOON TRIATHLON EVENT DESCRIPTION: The long course triathlon is a 1.2 mile swim in the crystal clear waters of Boulder Reservoir, a rolling 56 mile country ride on the roads of Boulder County (2-laps), and a scenic run capped off with a Slip n' Slide Finish The run course is a 2-lap loop half run course around the reservoir on the dirt roads and trails! 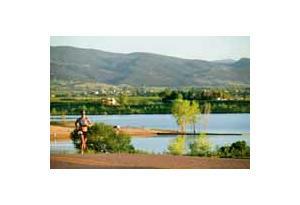 The Harvest Moon Triathlon is Colorado's longest running and most affordable long course. Why the small participant cap? Easy, we want to maintain a fun, laid back, yet competitive race atmosphere. To us you're more than a number and we want every athlete experience to be the best it can possibly be, whether it's your 1st long course or 10th year racing! So mark you calendars for September. The Harvest Moon Triathlon truly is where Colorado comes to race. HARVEST MOON DUATHLON EVENT DESCRIPTION: The Long Course Duathlon changes out the swim for a 5k run to start things out. Duathletes will all begin in the same wave after all of the swimmers have entered the water. An aid station will be set up at the finish of the 5K Run. Following the opening run, racers will then follow the same bike and second run courses as the triathletes. There will be one aid station at mile-3 of the first 5K run. The first 5k is rolling terrain with a mix of hard packed trail and wide cement running paths with a dirt shoulder. The 5430 Triathlon, Colorado's only long-course duathlon, attracts 100 athletes every year competing for great prizes and raffles from our sponsors!The Duathlon wave will take off at 7:30. Between us you have the hardest event of the day having to run twice, so we'd like to get you out of the sun before the heat of the day! Plus you'll hit the post race buffet and massage tent that much sooner! HARVEST MOON AQUABIKE EVENT DESCRIPTION: The Long Course Aquabike is the hottest growing segment of the Long Course Festival and has quickly become one of the largest long course aquabike's in the nation. The Aquabike (1.2m Swim / 56m Bike) will be the final swim wave to take off. After finishing the 56 mile bike all athletes will rack their bikes and exit transition as if starting the run, 200 meters into the run course athletes will turn off into the finish line. All returning athletes, YES, the Slip n' Slide finish line is back! Aquabike athletes will be the first to the massage tent, first to the food tent, and we'll start awards at 1:30pm. All aquabike athletes will be able to remove their bike from transition area after 12:30pm. The Harvest Moon Aquabike, Colorado's only long-course aquabike, attracts 150 athletes every year competing for great prizes and raffles from our sponsors!